The Center for Nanotechnology in Society at Arizona State University (CNS-ASU) seeks to fill one Post-Doctoral Associate position in the societal aspects of nano-scale science and engineering (NSE) starting October 2011. The post-doctoral associate is expected to collaborate closely with CNS-ASU researchers on the Center’s ongoing research and outreach activities, perform significant independent research, and contribute to educational programs. The fellowship is available for one year and renewable for additional years. Required qualifications for the post-doctoral fellowship include: a doctorate in a related area; demonstrated interest in the societal aspects of scientific and technological advance in general and nanotechnologies in particular; and evidence of high achievement in both research and teaching. Desired qualifications include interest and/or experience in: urban sustainability, equity issues, outreach and informal science education. Closing date is February 28, 2011; if not filled, every Friday until search is closed. A complete application consists of a detailed letter of application stating qualifications, experience, research plans, and teaching interests; curriculum vitae; and the names and contact information of three references. Please submit to: Regina Sanborn, Program Manager, Center for Nanotechnology in Society at Arizona State University at regina.sanborn@asu.edu (applications by email ONLY). Applications missing any of the required documents will not be considered. This appointment is dependent upon funding from a specific source other than state appropriations (i.e., a cooperative agreement and supplementary awards from the National Science Foundation for CNS-ASU). As such, this appointment may terminate if funding is not available. 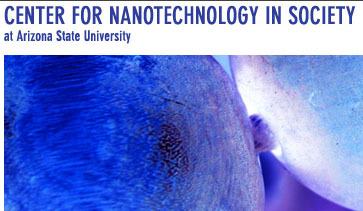 The Center for Nanotechnology in Society at Arizona State University (CNS-ASU) is a federally-funded research, education, and outreach center dedicated to understanding the legal, ethical, and other societal implications of nanotechnology. CNS-ASU works intimately with the Consortium for Science, Policy and Outcomes, which offers an innovative, interdisciplinary environment for developing and testing research and teaching ideas related to the governance and conduct of science and technology in the public interest. ASU conducts pre-employment screening for all positions, which includes a criminal background check, verification of work history, academic credentials, licenses, and certifications. Offered by the California Council on Science and Technology (CCST), the California Science and Technology Policy Fellowships place professional scientists and engineers in the California State Legislature for one-year appointments. These professional development opportunities will enable fellows to work hands on with policy-makers to develop solutions to complex scientific and technical issues facing California through their interaction with the legislative process. The fellowships are ideal for qualified applicants who are interested in improving the interface between science and legislative decision-making and who want to learn the public policy decision-making process. Fellows will be placed, for one year, in various offices of the California State Legislature. With increasingly complex science and technological issues facing society today, the effective interface of science and public policy is becoming ever more important. Building on the successful and highly acclaimed national model of the Science and Technology Policy Fellowships offered by the American Association for the Advancement of Science (AAAS) in the federal public policy arena, the California Science and Technology Policy Fellowships will create a similar interface in the California Legislature. The fellows will learn the intricacies of the California legislative process and will provide legislators and their staffs with clear and unbiased advice, answers to technical questions, and clarification of policy options for issues with science and technology related attributes. CCST is pleased to acknowledge the valuable input of the American Association for the Advancement of Science to help launch the California Science and Technology Policy Fellowships and the CCST Executive Oversight Committee for their guidance. More information is available here or by email: info@fellows.ccst.us. The application period for the 2011-2012 program will open on December 1, 2010 and close on March 31, 2011. In these programs, prospective applicants select a research project or projects from among the large group of opportunities listed on this website. Prior to completing an application, prospective applicants should contact the proposed Research Adviser to assure that funding will be available if their application is recommended by NRC panels. Once mutual interest is established between a prospective applicant and a Research Adviser, an application is submitted through the NRC WebRap system. Reviews are conducted four times each year and review results are available approximately 6-8 weeks following the application deadline. Prospective applicants should read carefully the details of the program to which they are applying. In particular, note eligibility details. Some laboratories have citizenship restrictions (open only to US citizens and permanent residents) and some laboratories have research opportunities that are not open to senior applicants (more than 5 years beyond the Ph.D.). When searching for research opportunities you may limit your search to only those laboratories which match your eligibility criteria. In addition, note the application deadlines, as not all laboratories participate in all reviews. Detailed program information, including instructions on how to apply online and a list of participating laboratories, is available on the NRC Research Associateship Programs Web site.